Annette Dixon, curator of the University of Michigan Museum. Jon Carsman found the source of his inspiration in the play of color and light reflected across the framed houses, streets and country sides of small town America. His paintings synthesize realism and fantasy. Color is an important factor in Carsman’s work. His pallet is vibrant and intense. Carsman isolates strong areas of color in juxtaposition with dark outline; the colors become crystallized motifs with a sparkling jewel-like quality. Color is the greatest emotional factor in painting and Carsman uses this device very successfully. Carsman paints broad areas of vivid high-key tones with a surprising effect that creates a dynamic interplay of light and shadow. An important work of art is one offering rich opportunity for aesthetic investigation. For this reason the paintings of Jon Carsman are of exceptional interest. His works reveal a consistent stylistic morphology; his links to the traditions of American realist painting demonstrate historical sophistication, and his works contribute significantly to the overall development of the new Realist style. Super Realism, a relatively new style that has emerged in America and Western Europe, is recognized as a major development in the history of comtemporary art. It is a style that, in all probablility, could not have been imagined twenty years ago when all serious art was primarily non-objective and based upon the painterly discoveries of Existentially oriented Abstract Expressionist art. Gregory Battcock, A singular Intensity, the Art of Jon Carsmancatalogue for touring show to Syracuse, Oklahoma City and Wichita, 1978. 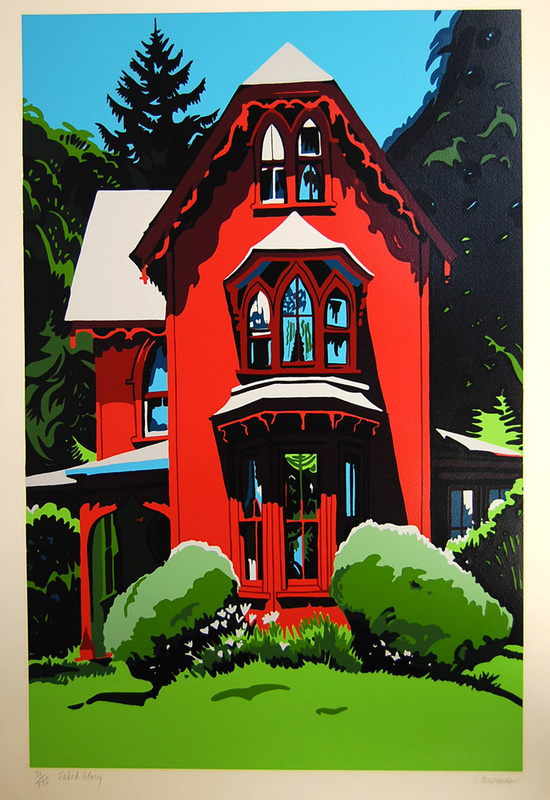 Jon Carsman was born in Wilkes Barre, Pennsylvania surrounded by the Applalachian Mountain Range where he found his inspiration in the play of color and light reflected across the framed houses, streets and countryside of small town America. Collections Hunstsville Museum of Art;Mobile Museum of Art;Phoenix Art Museum;Colorado Springs Fine Arts Center; Denver Art Museum; Museum of Fine Arts-St. Petersburg; Georgia Museum of Art; The University of Michigan Museum of Art; Weatherspoon Art Museum; Sheldon Memorial Art Gallery, Newark Museum; Brooklyn Museum of Art; Parrish Art Museum; Columbus Museum of Art; Miami University Art Museum; Hunter Museum of American Art; Cheekwood Museum of Art & Botanical Garden;Metropolitan Museum of Art, Neuberger Museum of Art and many other private and public collections.